New Orleans is practically synonymous with Mardi Gras. Both evoke the parades, the beads, the costumes, the food--the pomp and circumstance. The carnival krewes are the backbone of this Big Easy tradition. Every year, different krewes put on extravagant parties and celebrations to commemorate the beginning of the Lenten season. Historic krewes like Comus, Rex and Zulu that date back generations are intertwined with the greater history of New Orleans itself. Today, new krewes are inaugurated and widen a once exclusive part of New Orleans society. 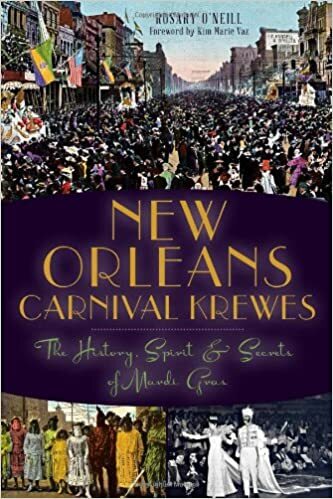 Through careful and detailed research of over three hundred sources, including fifty interviews with members of these organizations, author and New Orleans native Rosary O'Neill explores this storied institution, its antebellum roots and its effects in the twenty-first century..
admittance cards; invitations; and call-out cards. Mrs. CC. Personal letters, January 14, February 6, April 24 and April 26, 1972. Chairman of the Ten-Year Reunion Committee, Alumni of Sacred Heart Academy, New Orleans. Letter to alumni, April 14, 1972. (Mimeographed) Eleanor P. Thompson Collection, 1869–1939. Howard-Tilton Memorial Library, Tulane University, New Orleans. A miscellaneous collection of 366 pieces of material relating to social and business life of New Orleans in that era.